For some unexplainable reason, people often equate intelligence with human worth. 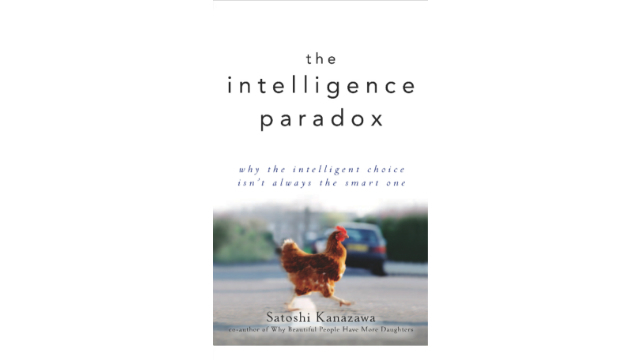 My book The Intelligence Paradox: Why the Intelligent Choice Isn’t Always the Smart One challenges some of the common misconceptions that people have about the nature of intelligence: What it is, what it does, and what it is good for (if anything). People have a tendency to equate intelligence with character, and to believe that intelligence is the ultimate gauge of an individual’s worth. They believe that people are not worthy human beings unless they are intelligent, at least in some way. Somehow, intelligence is regarded as the hallmark of human worth and character, the most important trait that any human can have. Conversely, people claim that, because all humans are equally worthy, they must all hold the potential to be equally intelligent as well. They balk at scientific discoveries that suggest that some groups of individuals on average may not be as intelligent as others, as if that is tantamount to saying that such groups of people are somehow less worthy humans because of their lower intelligence. When they realize that some people do not score high on standard IQ tests, they automatically assume that IQ tests must therefore be biased against some groups of people. They take group differences in performance on the IQ tests as prima facie evidence of such bias. At the same time, they also maintain that there are “multiple intelligences” and fabricate other types of “intelligences” such as “bodily-kinetic intelligence” for people who are athletic, and “interpersonal intelligence” for extroverted people who have social skills. No longer does it suffice to say that some people are athletic and others are social; they must all possess different kinds of “intelligences.” They have to ensure that everybody is intelligent in some way because everybody is an equally worthy human being. In my book, The Intelligence Paradox, I attempt to break the equation of intelligence with human worth, by pointing out that intelligence (and intelligent people) may not be what you think. While more intelligent people can do many things better and more efficiently than less intelligent people, there are many things that they cannot, and intelligent people tend to fail at the most important things in life from a purely biological perspective. The list of what intelligent people are not good at may surprise you. Intelligent people are only good at doing things that are relatively new in the course of human evolution. They are not necessarily good at doing things that our ancestors have always done, like finding and keeping a mate, being a parent, and making friends. Intelligent people tend not to be good at doing things that are most important in life. There is no question that intelligence is a positive trait, but then so are beauty, height, and health. Yet we don’t equate beauty, height, and health with human worth (although we do a little bit when it comes to beauty, by maintaining that people who are not physically attractive nonetheless have “inner beauty.” “Inner beauty” is to physical attractiveness what “multiple intelligences” are to intelligence.) We don’t necessarily think that beautiful, tall, or healthy people are better, more worthy humans than ugly, short, or unhealthy people. Nor do we claim that everyone is equally beautiful, equally tall, or equally healthy. But we seem to believe that more intelligent people are more worthy human beings. Or, conversely, because all humans ought to be equally worthy, they must all be equally intelligent. In The Intelligence Paradox, I attempt to convince you to stop having this assumption and break the equation of intelligence with human worth. Intelligence is just another quantitative trait of an individual like height or weight, nothing more, nothing less.